Born at Brooklyn, New York on 7 March 1852, he came to Winnipeg in 1882. 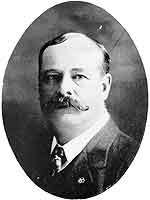 He purchased the Clarendon Hotel in 1894, at a time when it was one of the three best hotels in the city. He sold the property in 1904. He had two children: Homer Bunnell (b 1875) and Jennifer Bunnell (b 1881, wife of D. W. Dingwall). He died at Santa Monica, California in April 1928. “Pioneer hotelman dies in California” Manitoba Free Press, 7 April 1928.